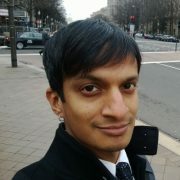 I’m Sumit Basu, a Principal Researcher in the Medical Devices Group at Microsoft Research, Redmond. My research focus is on developing interactive, machine-learning based power tools to assist users in understanding and extracting answers from complex data – physiological signals, teaching material/textbooks, computer systems, auditory signals like speech or music, scientific data, document collections, or the web. These power tools sometimes work by observing a user as they perform a task, then assisting them in their efforts once it understands what’s going on; in other cases (as in teaching) they provide inputs to the user and adaptively refine their strategy based on what works best. The interactive aspect comes from having humans in a tight loop with the learning algorithm: instead of getting a big batch of labeled data, interactive learning tasks involve a delicate dance between the human and the algorithm to achieve sufficient performance with a minimum of operator effort. These days, I’m particularly interested in how we can use such technologies to detect, analyze, and derive insights from physiological signals with the goal of helping patients monitor and improve their cardiovascular health. This is a deep and complex area, involving problems in signal processing, signal quality estimation, real-time classification, and data mining, as well as fundamental aspects of cardiovascular physiology. If you’re a bright graduate student interested in such problems and curious about internship opportunities, drop me a line! I received my BS (1995), MEng (1997), and PhD (2002) all from MIT in Electrical Engineering and Computer Science. I did my graduate work at the Media Lab with Professor Alex Pentland. My doctoral thesis, “Conversational Scene Analysis,” examined how machine learning and signal processing techniques could be used to understand the structure of conversational interactions from auditory signals without recognizing words. The common thread through all of my work to date has been the combination of human interaction and machine learning; fortunately there are an endless array of application areas of this ilk, especially if one is flexible in one’s definition of interaction. I recently joined the Medical Devices Group at Microsoft Research. We’ll have much more to say about the exciting project we’re working on very soon. Our new paper, “Deep Questions without Deep Understanding”, on a new technique for generating high-level (deep) questions from large spans of text (i.e., entire Wikipedia sections, as opposed to individual sentences), will be appearing in July at ACL 2015. ML for Physiological Signals: using machine learning to detect, analyze, and derive insights from physiological signals to help patients monitor and improve their cardiovascular health. Teaching with Machine Learning: using machine learning to help students and teachers of all ages and all types of educational goals achieve their objectives more effectively and efficiently. Sho: a powerful interactive environment for scientific computing and prototyping based on IronPython. Find out more and download it here. Also check out this code for getting real-time skeleton data from Kinect in Sho . Songsmith: a songwriting tool that takes melodies and helps develop accompaniments for them: based on this research with Dan Morris, it’s now a product (with much help from the MSR Advanced Development Team). Check it out and download the trial here. It’s also now free to many educational institutions via MSDN Academic Alliance and the Innovative Teachers’ Network. StickySorter: a tool for doing affinity diagramming and other flavors of information organization I developed with Julie Guinn and Office Labs: you can download it here. Sponsorship Chair, Intelligent User Interfaces 2015 (IUI’15) . Senior PC Member, Intelligent User Interfaces 2009 (IUI’09), 2010, 2011, 2012, 2013, 2014, 2015, 2016. PC Member, Learning at Scale 2015 (L@S 2015) . Co-Chair (with Jonathan Huang and Kalyan Veeramachaneni), DDE 2013: Workshop on Data-Driven Education at NIPS 2013. Co-Chair (with Ashish Kapoor), Workshop on Analysis and Design of Algorithms for Interactive Machine Learning (ADA-IML’09) at NIPS 2009. Co-Chair (with Armando Fox), Systems and Machine Learning Workshop, 2008 (SysML 2008). at OSDI 2008. Co-Chair (with Archana Ganapathi, Emre Kiciman, and Fei Sha), MLSys’07: Workshop on Statistical Learning Techniques for Systems Problems at NIPS 2007. Publicity Chair, NIPS 2007. You can see the poster I designed for the conference here. PC Member, Systems and Machine Learning Workshop, 2007 (SysML 2007). at NSDI 2007. For fall quarter 2007, Emre Kiciman and I taught a graduate course on Systems Applications of Machine Learning (cse599n) at the University of Washington. Other quarters, I co-taught the Markovia Seminar (cse590mv) on Machine Learning with Tanzeem Choudhury at the University of Washington. drawing/painting/illustration, singing/songwriting, and clothing design/modification.